CHARLOTTETOWN, PRINCE EDWARD ISLAND — Charlottetown is so immaculate it needed to invent its own mice population. Three years ago, miniature bronze mice began to appear throughout the downtown streets of this tidy provincial capital. Part of a scavenger hunt based on the character Eckhart the Mouse from author David Weale’s “The True Meaning of Crumbfest,” the mice are another cute aspect of a city that’s easy to adore for all of the reasons you might expect — Charlottetown is as friendly and attractive as its reputation — and for some reasons that will surprise you. Despite a population of less than 35,000, Charlottetown has a surprisingly upscale dining scene and lively bar atmosphere. Victoria Row, a pedestrian-only block of Richmond Street that’s bracketed by iron gates on either end, is home to patio bars and a summertime stage that features local musicians performing during the day. You can hear the music, which is often very good, from blocks away, creating a festive atmosphere in a downtown core that might otherwise seem sleepy on first encounter. A few blocks from Victoria Row is Lot 30, an outstanding eatery headed by chef Gordon Bailey (formerly of the Inn at Bay Fortune, PEI’s only entry in the 2012 Top 50 Restaurants in Canada list). The Lot 30 menu changes daily, although you can expect lots of seafood choices and an excellent steak. It fits perfectly with the generation of modern restaurants that emphasizes flavours from natural, local ingredients rather than thick, heavy sauces. Not surprisingly, the succulent scallops were a highlight of a recent five-course tasting menu that also included baked scallops and a dessert trio with luscious Bailey’s ice cream and chocolate mousse. Just as impressive is the quality of service, which is decidedly big city in its professionalism, a contrast to many other parts of Atlantic Canada where wait staffs tend to be friendly and polite but below-par in performance. Finding a restaurant of the level of accomplishment of Lot 30 is one eyeopener in Charlottetown, another is its newest hotel. A year ago, the Holman Grand Hotel debuted on the site that once belonged to a landmark retail store. It was the first hotel to open in the city in 25 years and it doesn’t disappoint. With a clean, eco-friendly design, the 80-room Holman Grand features large suites with touches that travellers to urban environments have come to expect, including room-darkening curtains, flat-screen TVs, turn-down service, complimentary bottles of water and free WiFi access. Although no building in the city is allowed to be taller than the spires of St. Dunstan’s Basilica, the Holman Grand has the advantage of being on the northern edge of downtown, a position on Grafton Street that gives its guests a splendid view of the city. 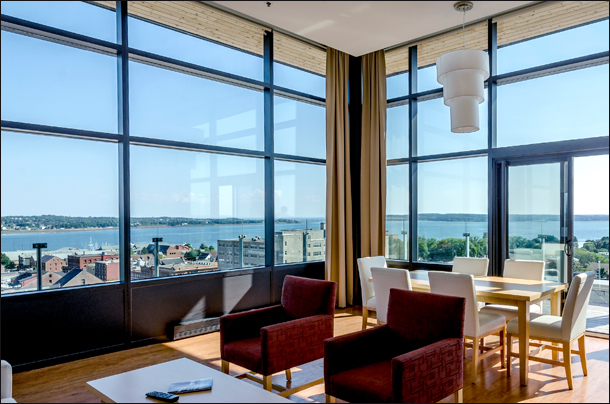 From the exquisite penthouse, which features an immense balcony, you can see clearly to Victoria Park in the west end of the city and beyond to the waters of the Northumberland Strait that separate PEI and Nova Scotia. “It’s the best view in the city,” boasts sales and marketing manager Suellen Clow, noting that the entire 10th-floor can be rented for just $1,400 a night. For a city in a province that Statistics Canada says has less than 5,000 immigrants and less than 2,000 visible minorities, Charlottetown doesn’t feel like a homogenous or insular place. It manages to maintain the charm of small-town traditions such as the annual Old Home Week festival, which began on August 9 this year and coincides with the Gold Cup & Saucer harnesses races that have been running for more than half a century. Sims is a steakhouse and oyster bar a short walk from the Redwater, which is just around the corner from Lot 30, which is close to Claddagh Oyster House, another well-regarded restaurant. If you just want drinks and pub food, Gahan House makes craft brews, including Sir John A.’s Honey Wheat Ale named after Canada’s first prime minister. It’s located on Sydney Street, one block south of Victoria Row. As a government town and one with deep importance to the history of Canada, Charlottetown won’t disappoint patriotic visitors. The Province House features the hall where John A. Macdonald and other leaders met in 1864 to establish the groundwork that would lead to the founding of Canada three years later. Costumed players re-enact key moments of that period in Canadian history on a daily basis at Province House, where the provincial legislature still meets. Meanwhile, near Victoria Row, a statue of Macdonald sits on a park bench, looking lonely for a companion — preferably one with a running bar tab at a nearby pub, you could presume. Along with history, you’ll also find examples of PEI’s other known attractions: golf and Anne of Green Gables. Plenty of Anne-related merchandise and memorabilia can be found in Charlottetown, including a chocolate store named after the fictional heroine whose global popularity has made PEI a destination in places like Japan and Australia. Cavendish, where the Anne attractions are centred, is an hour’s drive from the capital, and worth the trek. Long before Orlando had Mickey Mouse, or Charlottetown had Eckhart, Anne was around to show visitors her fictional world where time hardly seems to move. That’s the sort of experience I expected to find throughout PEI. Instead of a beautiful place with anachronistic charm, however, I found one with more sophistication than I imagined — and lots of fun, too.